Handing a caretaker a straw-in-juice cup; picking up a thin straw from the dining table with its fingertips of its hand and deftly passing and manipulating among fingers not to let it drop, then putting it into a delicate plastic cup handled by another hand softly without crushing it. 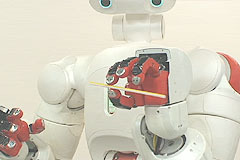 Faithfully following expected/ unexpected external force applied from persons to any part of the manipulator including the upper arm, forearm and even hand grasping an object, owing to passive impedance of arms and hands; mechanical compliance mounted to arm joints enabling persons to swing the manipulator quickly with a very small amount of force even by the little finger, which is useful for enhancing human-robot safe physical interaction: multi-finger coordinating motions based on force control using 6-axis force/torque sensors mounted on fingertips allowing to reduce the disturbance occurring to a plastic bottle handled by a hand not to let it drop. Copyright @ Sugano Laboratory, WASEDA University, 2007. All Rights Reserved.